Sometimes our life experiences help us to see things in Scripture we have never seen before. This happened to me as I read Genesis 26 in order to write today’s Life for Leaders devotion. I was struck by how much the theme of water runs through this chapter. In fact, eight times in Genesis 26 (26:15, 18, 19, 20, 21, 22, 25, 32) the narrative mentions wells for water. Wells are dug and filled with earth. Wells are celebrated and fought over. We understand, of course, that wells are necessary for the people in this story because without wells they would have no water. They and their livestock would either move away or perish. There was a time when I would have read quickly through Genesis 26 with little empathy. But today is different. Why? 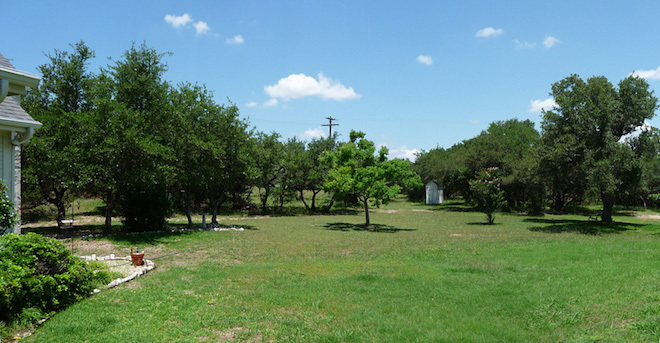 For seven years, I lived in the Hill Country of Texas. Our home was not connected to any water system, so we got all of our water from a well in our back yard. (You can see our well house in the photo above. It’s the small white building in the middle of the photo.) Now, this wasn’t the old fashioned bucket-in-and-open well set-up. The well went about 400 feet down into the aquifer beneath our property and was operated electrically. Now I live in California, which is in the middle of the worst drought in 1,000 years (literally; what is it about me and droughts?) I don’t have a well anymore, but the water that supplies my home is nothing to be taken for granted. If the drought does not lessen, my neighbors and I could be in desperate shape. Plus, a few hundred miles from where I live, wells are running dry at an alarming rate. So, because of my experience with wells and water shortages, I read Genesis 26 differently than I did before. I have much more empathy for the people described in this chapter and I understand as never before how water could be such a contentious issue. Why am I sharing this in today’s devotion? Because I want to encourage you to let your own life experiences open you to new understanding as you read the Bible. Let the Spirit of God show you things you have never seen before. Take time to reflect, to imagine yourself in the story, to allow the richness of your life to help you appreciate the invaluable riches of Scripture. God always has more to say to us through his Word. The questions is: Will we hear it? Can you think of a time when your life experience helped you see something in Scripture that you had missed before? What helps you be more open to God’s speaking to you through the Bible? Gracious God, thank you for all the ways you speak to us. Thank you for speaking to us through your inspired Word. Thank you for the times you show us something new. Thank you for your Spirit, who uses our life experiences to teach us, challenge us, and inspire us. Help me, dear Lord, to be open and available to you. May I hear what you want to say to me today, tomorrow, and every day. Amen.